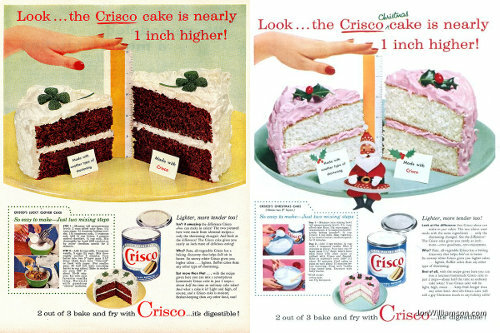 So, I was rather intrigued when I came across a series of mid-1950s Crisco advertisements that promised “lighter, more tender” cake. Knowing that they also invented the whole “more digestible” baloney, I don’t have much confidence in this. What I particularly liked about these was the later holiday-themed versions. Change the cake and frosting flavors, add some decoration, sure. But it’s too much bother to get a new hand model or ruler. STEP 1 — Measure (all measurements level): 2 cups sifted cake flour, 1-2/3 cups sugar, 1/2 teaspoons baking powder, 1-1/2 teaspoons soda, 1 teaspoon salt. Add 1/2 cup Crisco, 3 squares melted chocolate, 2/3 cup milk. Mix thoroughly by hand (300 strokes) or by mixer (medium speed) for 2 minutes. STEP 2 — Add 2/3 cup milk, 1 teaspoon vanilla, 3 eggs (2/3 cup). Mix thoroughly another 2 minutes. Pour batter into two 9″ layer pans (1-1/2″ deep) which have been “Criscoed” or lined with paper. (For smaller pans, fill half full, bake remaining batter in cup cakes.) Bake in moderate oven 350°F. about 35-40 minutes. So, one whole inch taller — that’s 1/2 inch per layer. Is there anything to this? Let’s find out! There actually needed to be three cake attempts. In the first, I didn’t realize that Baker’s Chocolate has reworked the bar format to a shape much more like a candy bar: very flat squares. Instead of “one square” being 1 oz., it is now 1/4 oz. 3/4 oz. of chocolate makes a very, very mild cake. Once all the dumb measurement errors got sorted, it turned out to be a really simple recipe to follow. Dump and mix. I’m making one Crisco and one butter cake. It makes a fairly fluffy batter, with whichever shortening you use. The key question is whether that will collapse in the oven while baking, though! You’ll note these aren’t simultaneous photographs… that’s because while I like making cake, I’m not so enamored of it that I want to have two whole cakes at once. But on the right is Crisco, and on the left is butter. Notice the difference? They tasted equally delicious, though. So feel free to just make extra layers if you want a taller cake. The basic (original?) cake recipe comes from Millie Motts, the St. Patrick’s Day version from Shelf Life Taste Test, and the Christmas copy from Jon Williamson. As always, I am grateful for other vintage enthusiasts who enable recipe tests like this! I’ve never had a cake made with butter collapse on me like that. Me neither, actually; I assume it’s something to do with the liquid-fat ratios being specifically adapted to Crisco rather than butter. A better comparison might be a good butter recipe vs. the Crisco version! The only logical solution is more cake. I like solutions like that. What makes the collapse even odder to me is that when I lived abroad and didn’t have easy access to Crisco (who the HECK is going to pay $14 at the American import shop for a small can of it? NOT ME! ), so if a baking recipe called for Crisco, I’d just replace it with butter and never had any problems. The cakes were delicious, even when made without the full amount of chocolate. Personally, the height of a cake is not a very salient variable for me, but I suppose that if you’re hosting a party, having your cake stand taller can’t make it look less impressive. Maybe that’s a good strategy with kids, actually. You can satisfy them with a bigger piece if it’s got more air in it. I rarely made cakes then and now, but much prefer them from scratch. Chocolate always came out much better than any other kind, a good yellow cake is a rarity. My wife and D-i-L both had cakes fall apart or go flat recently. One was a box mix, one was a scratch cake. I’m not a pro baker, but it seems to me that my mother, aunts, grandmother used to beat / mix cakes a LOT longer than I see them doing now. I make a banana quick bread that never falls and always stays together. I mix it long and as slow as I can. So I wonder if that could be the problem, not enough air mixed in to be fluffy, not enough gluten developed to hold it together? They were both mixed the same amount of time (within ~30 seconds) — all I changed was the shortening. The other possible variable is the temperature/humidity level (I baked them a week or so apart), although I couldn’t tell you which was the cool day! Pah. My grandmother made her cake batter with LARD. She made the frosting with it too, sometimes. There’s some old school cooking for you. BTW, she still had the cast iron, wood-burning stove she got when she married in 1923. My brothers and I cleaned it out, and put some wood in it once, lit it up. The damned thing STILL worked! We got yelled at like you wouldn’t believe for setting it in July. In Texas. But we had to know if it would work.